Kerala cuisine is blessed with many coconut flavoured dishes.Erissery is just one among them.I’ve had erissery made with different vegetables like Mathanga(Pumpkin),Vaazha kaya(Raw Banana) and Chena(Elephant yam),but Padavalanga-Parippu erissery was completely new to me. Thanks again to our dear Shynee of Indian Potpourri,she has a huge collection of authentic Kerala recipes in her blog,especially from Malabar. 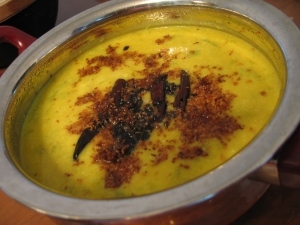 Pressure cook dal and snakegourd pieces together by adding necessary water,salt ,red chilly powder and turmeric powder. Mash it well with a spatula and keep aside.Now grind together 1 cup of coconut,green chillies and cumin seeds into a medium fine paste and add it to the cooked dal.Turn the stove on and cook it for 2 or 3 minutes,stirring continuosly.Add more water accordingly. Heat a pan and dry fry 1 tsp of grated coconut till brown in color and keep it aside.Now heat ghee in another pan and allow mustard seeds and urad dal to splutter.Add shallots,red chillies and curry leaves into it and fry till brown.Add it to the dal along with the browned coconut.Mix well and serve hot.It goes very well with rice. This entry was posted on August 7, 2006 at 7:54 am	and is filed under Blogger's Recipes, Dals & Pulses, Traditional Kerala Dishes, Veg Dishes. You can follow any responses to this entry through the RSS 2.0 feed. You can leave a response, or trackback from your own site. Hmm I have made this too…I couldn’t take a picture. It was so delicious. You are right about shynee’s blog. She has such a wonderful collection of recipes. I’ve read about it in ur blog RP! !..And many thanks for the comment..
looks good.i too had blogged about it earlier.. except i used tuvar dal not moong. Its good to easy all these tradiitonal recipes get a foothold. Yes..shaheen..u said it..My hubby hates tuvar dal..Thats why I used moong dal..I’m sure it’ll be good with tuvar dal as well. This is soo good…Thanks a lot! u got a good collection of kerala receipes…just wondering whether u cud blog on how to make olan? 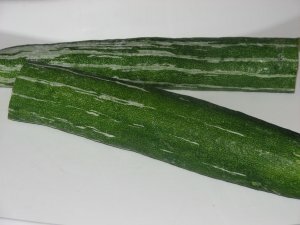 i have had this very long long back as a side dish (?) in one sadya…do u know how to make it? is this a main curry or a side dish? yeah,i’ll surely be blogging about it Minu,Probably this month itself..anyway before Onam..Do check..And many thanks for dropping by. I really like your blog.I could come to know many of our authentic dishes through you.thank u very much.Can You please tell me the recipe of our Paalada Pradhaman. Thnkx a lot. I tried it and it came out really delicious…Today is my husband’s birthday and this would surely be a surprise dish for him…. Google TV looks absolutely astounding. I don’t know if I wish to get a tv with it included or maybe a standalone box.